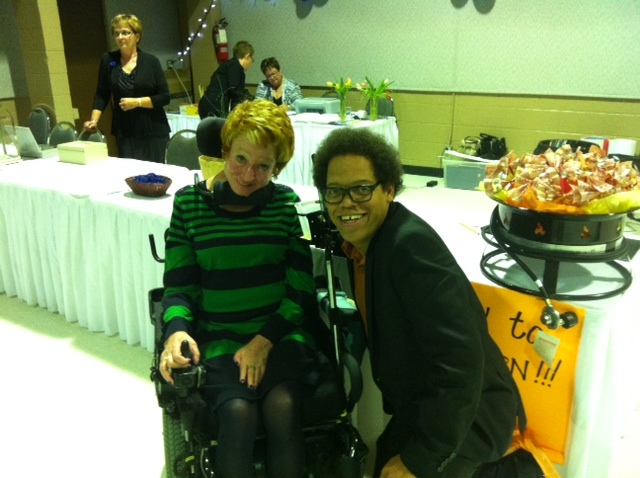 Saturday, April 27th/2013, comedian Greg Morton performed at the at the 15th Annual Charity Benefit for ALS in Lloydminster. The small town with a big and generous heart on the border of Alberta and Saskatchewan. Earlier that morning, I caught up with Colleen Christie, the remarkable woman who started it all. I found her zipping around in her chair making last minute preparations for that evening’s dinner, show, and silent auction. She asked me if everything was okay and if my room was comfortable. She even supplied me with several bottles of water and a couple of cans of my favourite addiction, RED BULL ENERGY DRINK! I was left thinking, WOW! This woman has ALS? She has more energy than I do!!! What is ALS? Amyotrophic Lateral Sclerosis, also known as Lou Gehrig’s Disease, attacks the motor neurons which convey the brain’s electrical impulses or signals to muscles throughout the body. When the muscles do not receive these messages, they lose their strength and in time the patient becomes paralyzed. ALS manifest itself in different ways, some people trip and fall, some lose the use of their hands and arms, some find it difficult to swallow and some have difficulty breathing. ALS does not affect the senses – touch, taste, sight, smell or hearing. All the proceeds from last nights benefit went to the University of Alberta ALS research Team, ALS Society of Alberta for research, special equipment and information. I had such a great time performing at the Lloydminster Exhibition Stockade Center last night, and it is my sincere hope that one day, we will find a cure for this disease.